Are you thinking about launching a new website? Or do you anticipate rebooting your whole site but don’t necessarily want it to be offline the entire time? If either of these scenarios sound like your current situation, it’s probably a good idea to consider using a “Coming Soon” WordPress theme while you get all of your digital ducks in a row. If you use an “Under Construction” or “Coming Soon” placeholder template, people will have an understanding of what your site is about if it’s yet to launch, or that it’s currently being updated if you’re doing a redesign. These themes act as a golden opportunity to keep your visitors in-the-know, announce your latest company news and more, without even having your full site up and running yet. What Does a Coming Soon Page Do, Exactly? A coming soon page acts as a heads up to your site visitors as to what’s currently going on with your company. If you are just starting a business and have secured the domain but don’t have a site up and running yet, you can throw up a “Coming Soon” page and alert visitors that a full website will soon be there in the future. You can also take that opportunity to encourage visitors to sign up for your email list to be the first to know when your site goes live, or to connect with you on social media. You don’t need to have a brand new site to qualify for using a “Coming Soon” page. In fact, established businesses make use of them as well. In these cases, they can act as an announcement of what’s to come—a new site design, a new product, an upcoming event, or anything else you can think of. Clue your visitors in and they won’t go running scared if something on your site isn’t 100% perfect. You’d be surprised by how understanding people can be if you just give them a heads up! 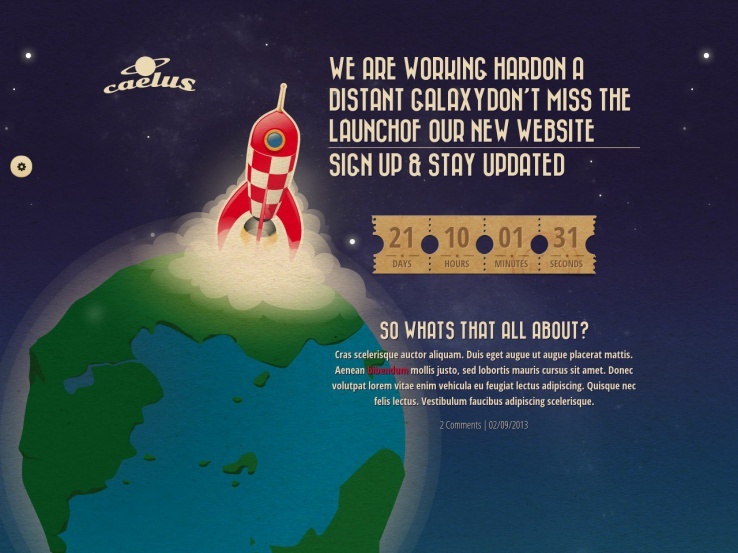 The Caelus theme provides both a landing page and “Coming Soon” option. The two color schemes allow for a little customization without forcing too many options on you. The best feature with this theme is the MailChimp support, since you can quickly set up a free MailChimp account and capture emails as users come to your website. This responsive theme has eight custom widgets for you to modify exactly how you want the landing page or “Coming Soon” page to look, and the slab text feature lets you create eye-catching headlines, which is always important for adding your own branding touch. Since around 50% of all website traffic now comes from mobile phones, this theme includes an iPhone slider feature for users to learn about your company with a few simple swipes. The Start template has an image and slider version, allowing for a quick slideshow in the background or a static image. The responsive layout is a great way to ensure your mobile visitors will be able to view your website without any issues. It’s MailChimp ready, and a working contact form is included in the theme so your customers can get in touch with you even before the website is completed. Integrate your Twitter feed to connect with your audience, or include a timer that shares how many hours, days or months are left until your launch. The theme also offers FontAwesome icons to style your “Coming Soon” page without any coding knowledge. It’s a one-page theme with an area to display your features or services, and you can also add icons to your most popular social media pages. 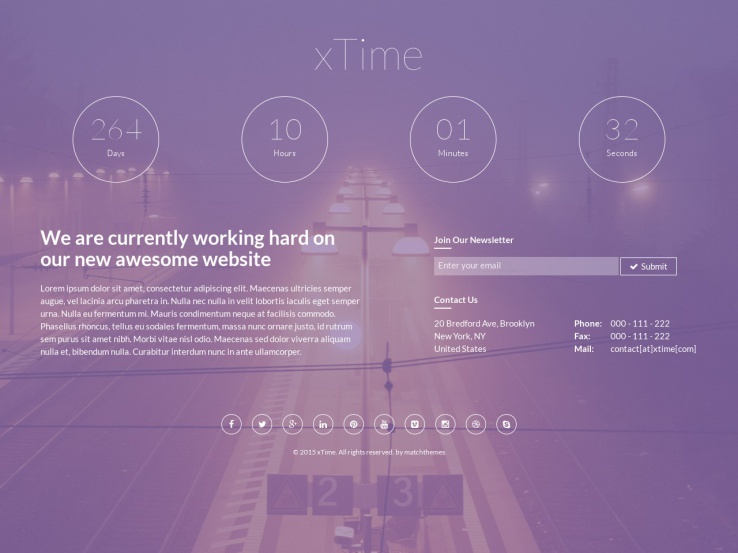 The xTime theme from Mojo-Themes is a fully responsive theme, with four types of backgrounds to style your “Coming Soon” page. The background has a color gradient overlay to keep everything enticing, and the social icons are simple and easy to implement. The four background options include a full-screen slider, single full-screen background image, YouTube video background, and a solid color background. Google Fonts and FontAwesome icon font sets are available to add your own branding and style. Thanks to the responsiveness of this theme, your mobile visitors will be able to see all the important information without any problems. MyCountdown is one of the most fun “Coming Soon” themes on the list because it shows an animated timer with little droplets that fall into vials and turn the ticker towards zero. An email subscription form is included on the left-hand side of the page, and you can even incorporate social media links with modules for showing off your most recent posts. The footer area is also somewhat unique in the this niche, as it lets you display recent news and a small “About” page widget. The responsive theme is packaged with six color options and a contact form for collecting inquiries about your business. 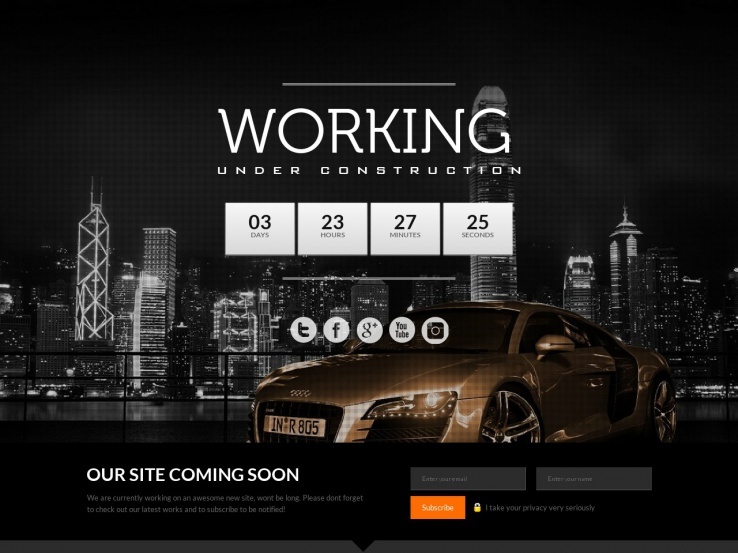 Feel free to upload your own logo and entice your potential customers with this playful “Coming Soon” theme. 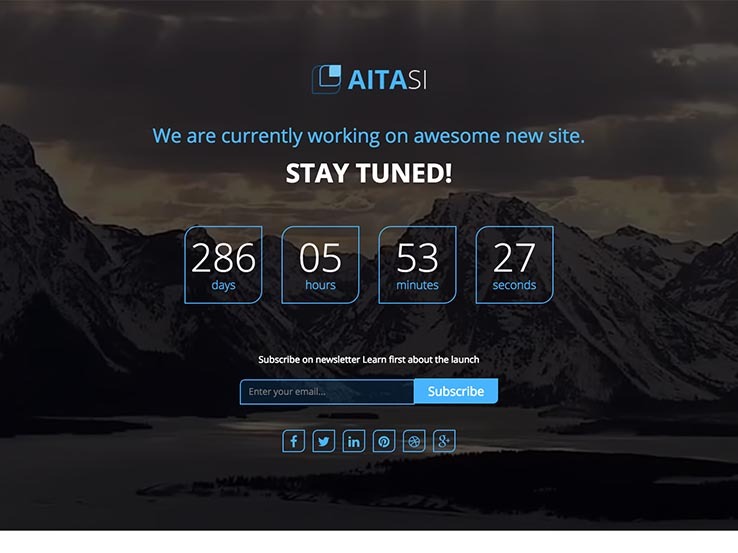 Aitasi is an “Under Construction” page that provides several color schemes, but the truly unique feature is that is offers three different page layouts. You can choose between an image, a slider or a video background. They all look elegant and are a great way to grab the attention of your visitors. The theme is divided into four sections on the main page, so you can include a mailing list signup form, timer, a features page, an About Us page, and a Contact page. All of this is merged onto a single homepage, providing detailed information about your company before the entire site goes live. The theme is fully responsive, and it comes with Font Awesome icons to eliminate the need for coding you would otherwise have to work on. Free Google Fonts are also included so you can integrate a font that matches your website branding. 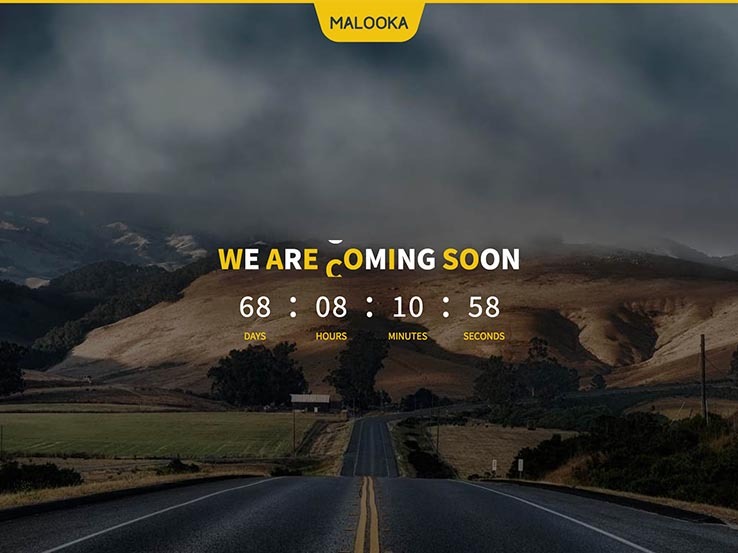 The Malooka theme is a powerhouse in terms of “Coming Soon” and “Under Construction” templates because you get to choose from eight different layouts including a background pattern, parallax background, map background, and an image slider. The fully responsive design integrates perfectly with Google Maps so visitors can find your location easily and you can share updates from your Twitter or Flickr feeds. The clean design is easy to customize with an easy-to-use interface that even beginners can use to create the perfect look and feel for their website. Display an area with a countdown timer, share what your services are all about and include a contact form at the bottom of your page to bring in interested users. Another cool module is the “Meet Our Team” area, with pictures and links to social media pages. The MUMM theme provides a wonderful way to stand out from your competition because it features a split-screen that slides in opposite directions when someone uses their mouse to scroll down the webpage. Customers always see two columns, which consolidates the content and makes it easier to view. Type in a description and upload your logo. The countdown timer and email subscription forms work wonders for building buzz about your business. The theme also gives you modules for a contact form, social media buttons, and an area to explain what your company is all about. The image gallery slider is a nice touch as well. 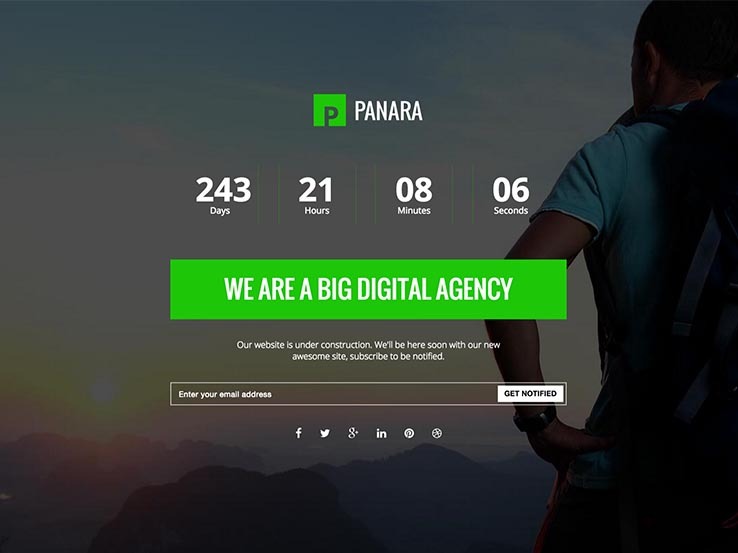 The Panara theme offers a responsive design, with full-screen scrolling and keyboard navigation. The contact form is a great way to let your visitors get in touch with you, while the subscription form is sure to bring in new customers and build your email list. 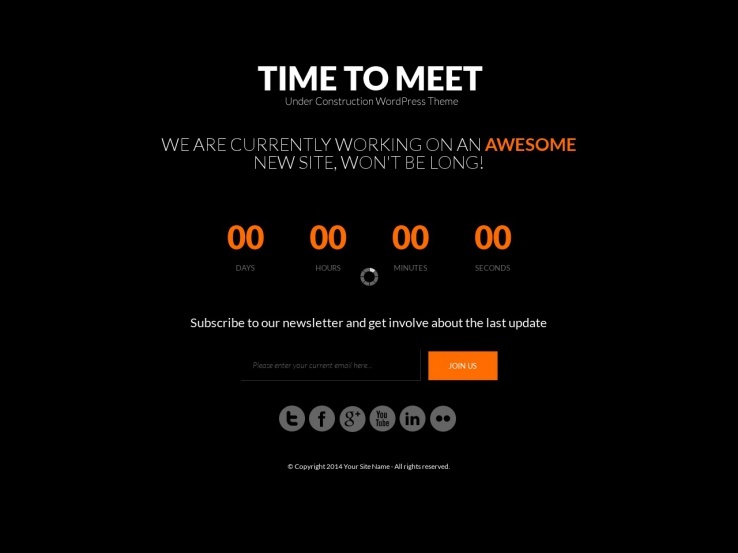 The theme also includes a countdown timer to keep your website visitors up-to-date on your launch day. Although the theme is meant to be ready to use as soon you install it, there are still basic customization options available. You can use any of the premade modules, Google Fonts, and CSS Toolkit to add your own style and branding with ease. The Verde theme has a clean and minimal design that eliminates unnecessary clutter and brings the focus onto your most important content–the launch day. The theme is completely responsive, which means it will look great on mobile devices, and it has five cool text effects to add some creativity to your site. A standout feature is how Verde integrates so nicely with YouTube and Vimeo videos, making it ideal to feature an introductory video for your startup or new blog. A Twitter feed is also included, along with a MailChimp subscription form that allows you to easily grow your email list as you work on your website. We also enjoy the countdown module, which tells people when they can expect to see your entire site. The Google Maps background is another handy tool if your business has a physical location. Along with plenty of documentation, an AJAX contact form and a message to warn people about cookies, the Verde – Minimal Coming Soon Template is one of the best options on this list. 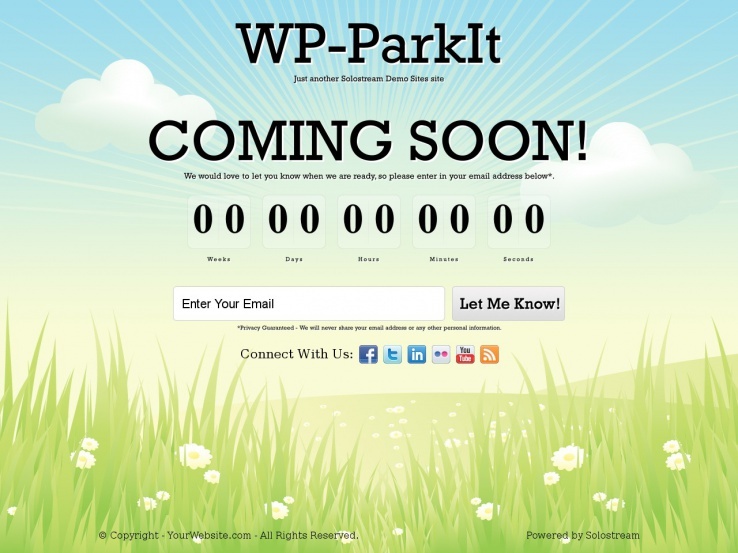 When it comes to the top “Coming Soon” WordPress themes, the WP-ParkIt option is a great choice considering it’s completely responsive and offers a single-page layout with plenty of settings for you to play around with. Every setting can be tweaked with a click of a button without the need to touch any code, and you can collect and export emails into various email newsletter service providers such as MailChimp. Adjust the built-in countdown timer to build buzz about your company and to announce the official launch day. Google Analytics is included, which is wonderful for checking in on your visitors and understanding your demographics. Social networking integration comes along with the WP-ParkIt theme, allowing your visitors to follow you on social media and share the news about your launch. On top of that, the theme includes a customizable “Thank You” message that is sent when someone subscribes to your email list. Change the “Coming Soon” message to explain what the page is all about, and watch as users begin talking about your company. You can also upload a logo of your own and change the background if needed. In terms of the best placeholder templateson the market, this is certainly one to keep your eye on. 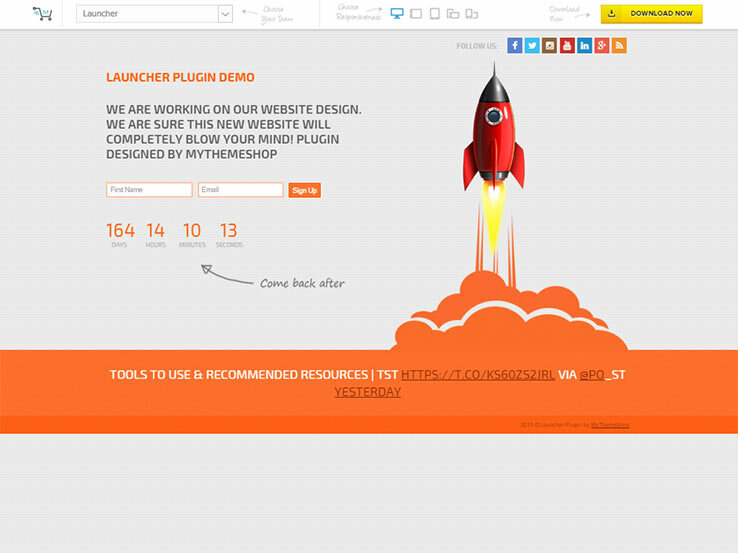 The Launcher WordPress theme delivers a stunning take on the regular “Coming Soon” WordPress themes that you generally see. For starters, you can choose between three layouts in different styles. Choose a modern look, a retro feel, or a colorful and playful design depending on your niche. Regardless of the front page layout you choose, they are all going to provide similar features to play around with. 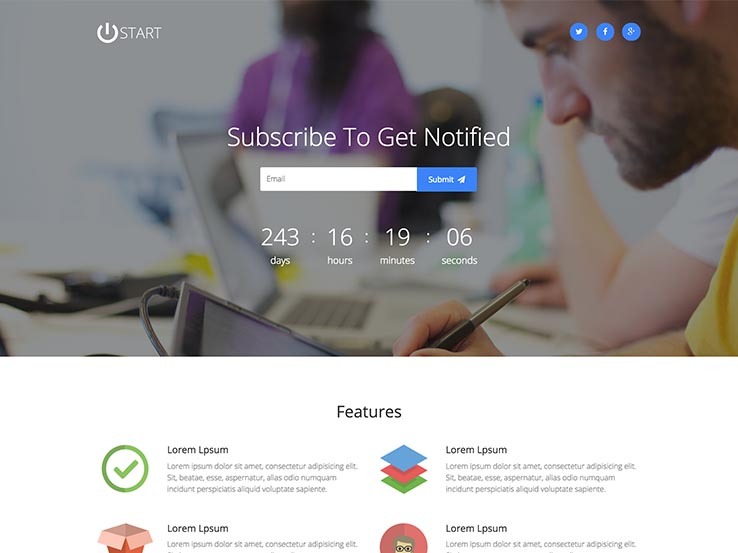 The theme includes a timer to show people exactly when you plan on launching your business or product. You can also collect email addresses from folks who are interested and connect to services like MailChimp. Several social media buttons are packaged into the theme, improving your chances of going viral. A live Twitter feed works nicely to keep your visitors up-to-date with all the important milestones. Another important area is the header and description. Don’t forget to include your logo, but also focus on polishing the title and the description. After all, you need to encourage your visitors to sign up for your email list and come back once the launch date arrives. The theme is completely responsive, which means it will look great on smaller screens. The timer is not the only promotional tool that comes along with the Launcher theme–a contact form keeps you in touch with all of your customers, and it even supports Mad Mimi if you’d like to send out quick email newsletters to people supporting your company. 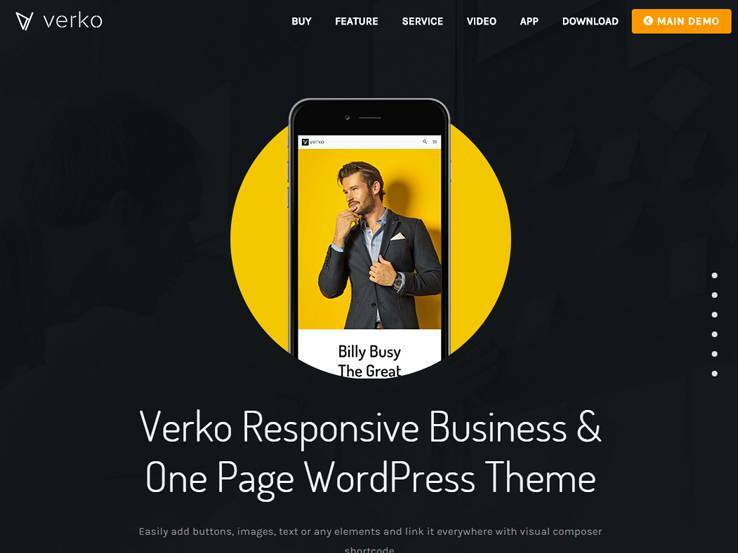 The Verko WordPress theme is more than just a “Coming Soon” page, and we like that because once your launch day arrives, you can use Verko to build your entire website. It’s a responsive one-page business theme with several demos that help promote your business. The “Coming Soon” layout gives you a customizable background and a sleek countdown timer to show how much time is left until the official launch day. You can also upload your logo from the back-end. 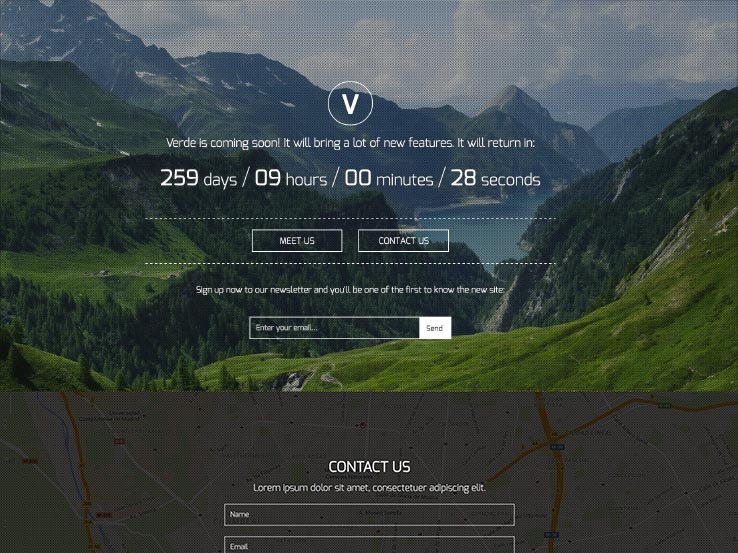 Aside from those specific features for the “Coming Soon” layout, Verko includes a number of other features to be used with other templates. A parallax header is great for grabbing the attention of your visitors, while the vertical navigation makes it easy for people to navigate your website. Consider having a video header to explain what your company does, and take advantage of the custom footer to place widgets. The Verko theme includes a drag-and-drop Visual Composer plugin–one of the best plugins around for customizing your website without the need to touch any code. It’s great for both beginners and advanced users alike, as all of the design tools are consolidated into a visual layout. The Master Slider plugin comes with the Verko theme as well, improving your sliders and giving you tools for animations, overlaying text and more. Along with mega menus, Google Fonts and support for Contact Form 7, the Verko theme is a wonderful choice for your “Coming Soon” page and whatever type of website you need into the future. 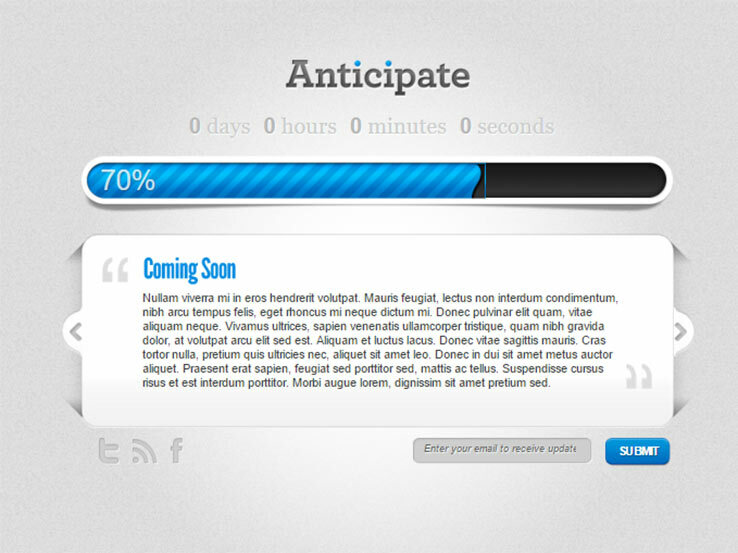 Anticipate is another theme you should consider for setting up an “Under Construction” or “Coming Soon” site. It’s totally simple and very straightforward. This theme is about efficiency and effectivity. It displays your site title up top with a countdown timer and progress bar for easy visual reference. Next, you can include several different messages to keep your website visitors up to date with all the important news regarding your launch. The theme also includes a call-to-action button to encourage users to sign up for your email list. Finally, you can display your social media icons to grow your social media following. It doesn’t get much simpler than Anticipate, and that’s precisely why we like it. 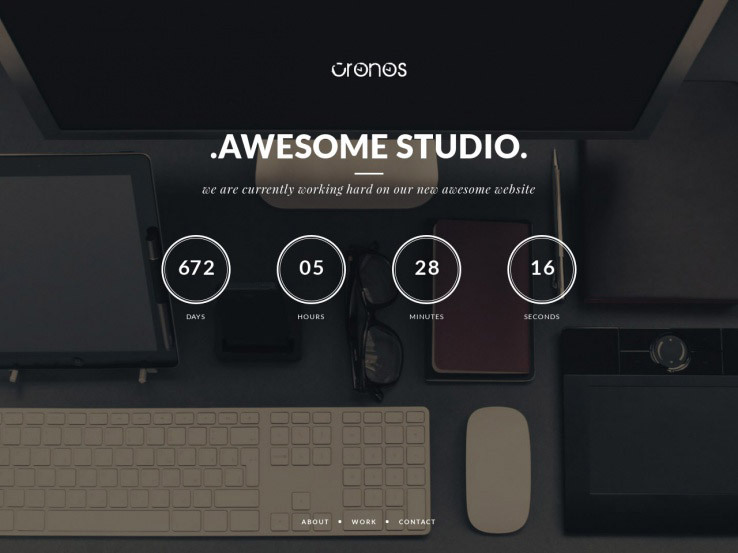 Cronos, developed by Matchthemes, is a stylish “Coming Soon” theme that does so much more than just announce your site is under construction. Yes, it offers a prominent countdown timer, but it also lets you establish an “About” section that clearly describes what your company stands for. You can even use this space to highlight your services or include more details about various packages you offer. You can display your work in the grid-style portfolio section and encourage visitors to get in touch with you, thanks to the prominent contact form that sits alongside your contact info and a map. Populate the footer with your social media icons and your site will be ready to represent your company in style. 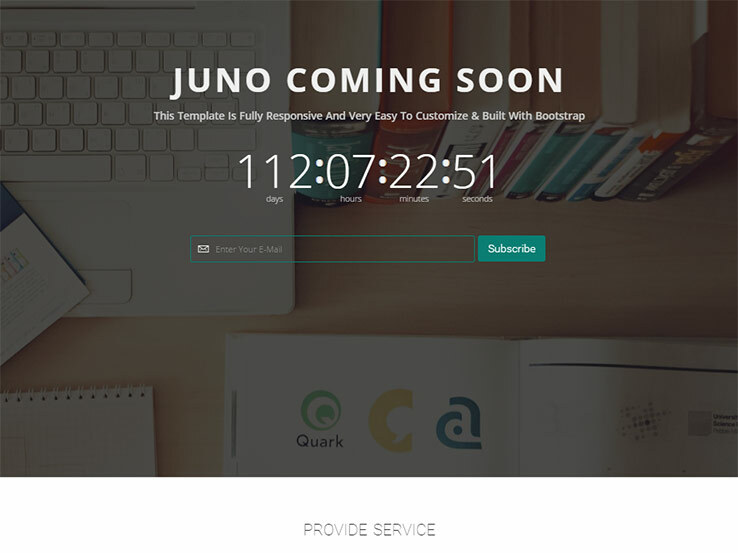 Meet Juno, a fully responsive “coming soon” theme with two background options, a countdown timer to let visitors know when your site launches, and an email subscription module to capture emails. You’ll have the option for an image background, or a slider background. This one-page template has sections for your services, team members, testimonials, and portfolio. It also includes a contact form so people can easily get in touch with you. Visitors will also be able to connect with you on social media thanks to the available social icons. You’ll also find unlimited color schemes and Google fonts support to cater for your branding purposes. 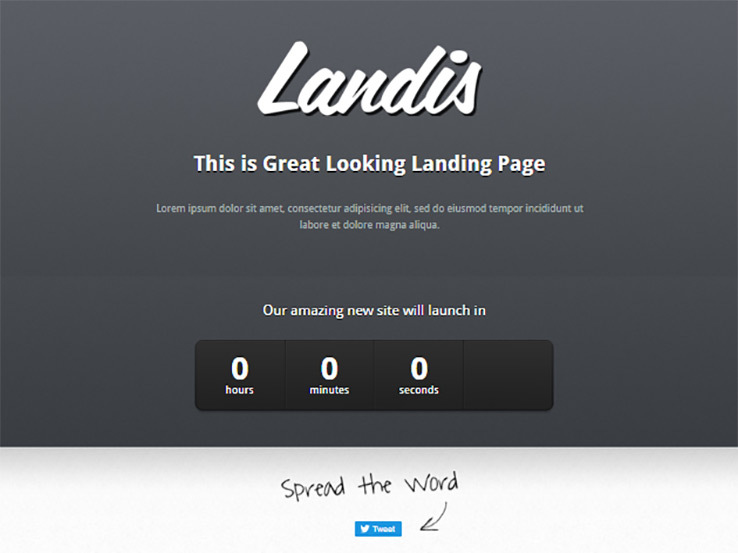 The Landis Business WordPress theme comes from the folks at ThemesKingdom, and it provides a simple, one-page theme to notify your visitors about the launch date for your brand new website or a redesign coming to your existing website. The theme includes a countdown timer as well as a few color schemes to give you a starting point when setting up the theme. 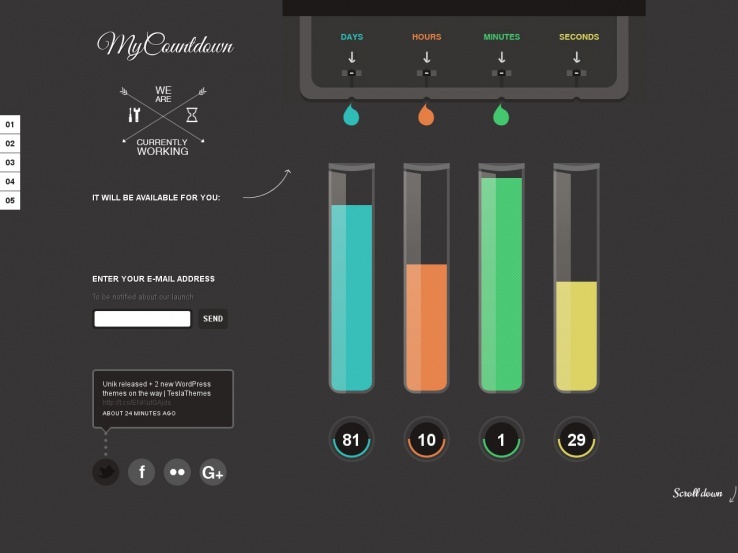 These colors can be changed instantly from your WordPress dashboard. A cool feature of the Landis Business theme is that you can place social sharing buttons towards the bottom of the homepage, allowing your visitors to share your coming soon page with their own followers and help you build the anticipation. Along with the above features, the Landis Business theme offers an area for your logo, which is easily uploaded. Add a tagline and information about your new website or any new features which can be expected once the launch day arrives. The theme is completely free if you register with ThemesKingdom, but you can also join the company club to gain access to multiple themes in the database. 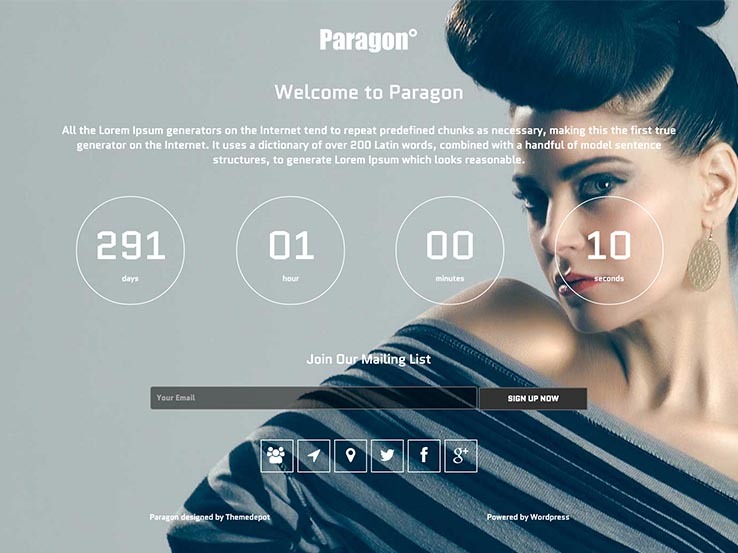 The Paragon theme has three layouts to choose from: a full-screen image, a full-screen slider, and a full-screen video. The timer overlays on top of a stylish background area, which is customizable itself. Design a mailing list signup form, and include your social media buttons to increase your followers. The top of the “Coming Soon” theme has an area to upload a logo and describe what your business is all about. With more than 500 Google Fonts and unlimited color schemes, you can’t go wrong in terms of customization with this WordPress theme. The Time to Meet theme has just about everything you could ask for in a placeholder webpage since it includes a timer for counting down to the big day, an email subscription form and some stylish social media buttons to grow your social media following. The responsive layout is search engine-optimized, allowing you to move up the rankings while building your website. The custom background slider offers various options to include different pictures and colors. Although the theme is designed for beginners, it also comes packaged with the logo font and PSD files; therefore giving more advanced designers the chance to make changes. Even if you decide not to change the background, the theme looks rather appealing, with bold fonts and a darker background for highlighting all of your content on the page. The Working theme is sure to grab the attention of anyone who lands on your website, with a stunning parallax slider and timer to ramp up the anticipation of your launch. Upload a logo and add your social media links with just a few simple clicks. The mailing list signup form blends well with the design, and you can even incorporate a gallery at the bottom of the page to give people a preview of what they can expect. This gallery can be used as a filterable portfolio, allowing you to showcase your future services with ease. The email signup form we mentioned earlier integrates perfectly with MailChimp so you can easily grow your email list and notify your subscribers when your site goes live. Additionally, the logo Photoshop document and fonts come along with your purchase for some additional modification options. The Glance theme provides a responsive layout so even those visiting your website on a mobile device will have no problems viewing your placeholder webpage. You can choose between a background slider or a video background, which both look stylish and are sure to make a great visual impression on your visitors. Upload your own logo, show off a countdown timer and include your social media buttons to send people to your Facebook and Twitter. 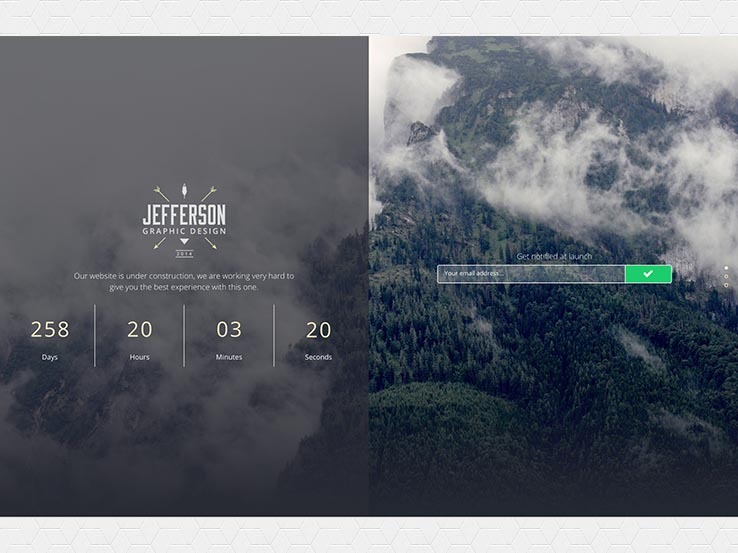 A unique feature is the milestone section, similar to a KickStarter campaign, where the site owner shares design progress. The scrolling effect keeps your background in one place, while the foreground moves up and down, and the color picker makes it easy to change colors to your own unique style. The GapInvite landing page provides layouts for both sliders and images in the background. Choose between a light or dark background, and incorporate a timer to let people know how much time is left until your website launches. The theme includes a weather widget, and you can always collect emails through the signup form. Keep in mind that social media integration is a must with “Coming Soon” pages, and the GapInvite theme has everything you need to get that setup. On top of that, it has a nice “About Us” page for sharing your story. 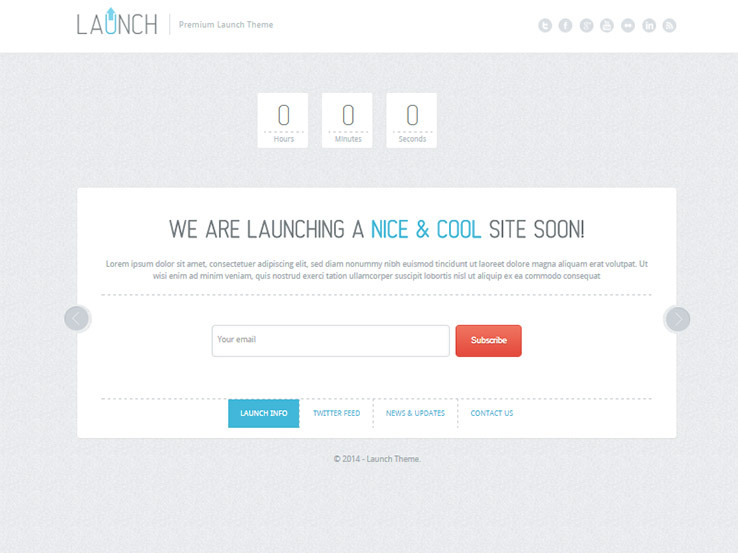 The Launch WordPress theme offers a single page interface to start bringing in customers for your website or company. It has a clean design and localization support to broaden your horizons and bring in more people. The easy theme options can be used by just about anyone, and the email form allows for integration with many of the large email services like MailChimp and AWeber. The Twitter feed is a nice touch since it helps you share updates on what your company is doing, while the news area supports comments for people to chat about your products and get excited about the launch. Another cool feature is a contact form so people can send you messages before you release the full website. Feel free to change the background to fit your own company branding strategy and enjoy all the benefits of the responsive design. If you check out the demo you’ll see that the countdown timer is positioned right at the top, and you can set it to whatever you want. The theme also includes icons for social media to connect with your audience on their preferred social media network. The greatest part of the Launch theme is that the email subscription form sits on a slider, moving to other pages such as the news and contact pages. It’s all here for you to play around with, so check out the Launch theme and you won’t be disappointed. 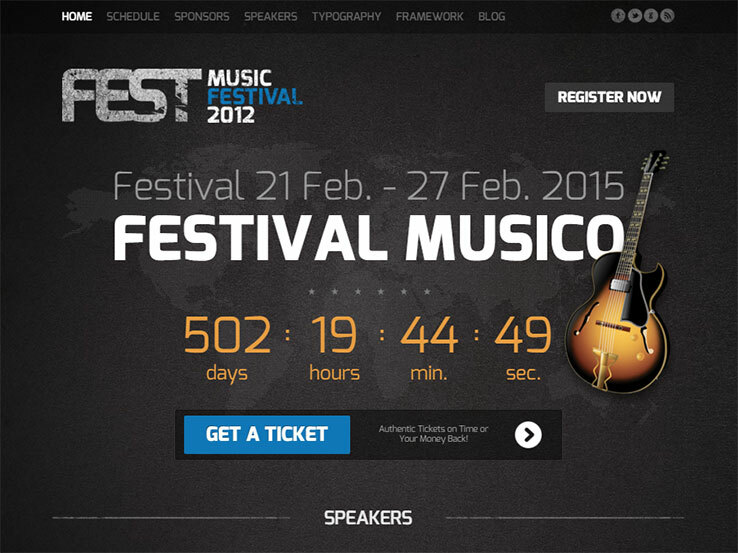 The Fest theme is the perfect placeholder page theme for upcoming music festivals, concerts, or conventions. 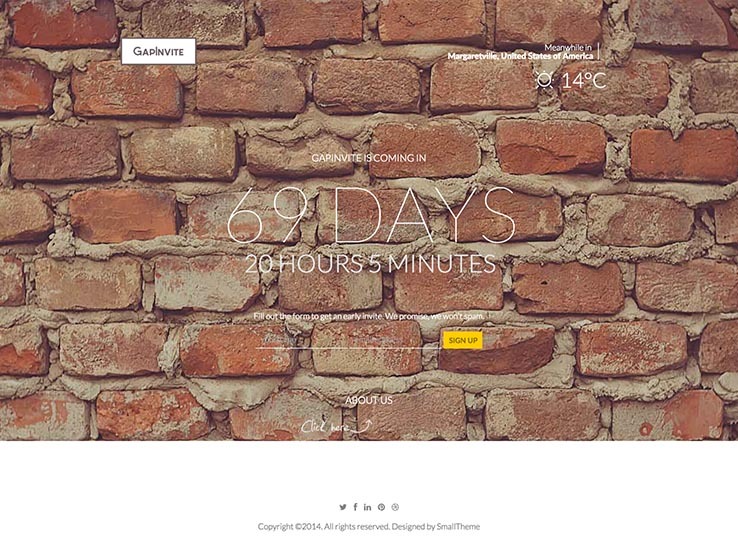 Developed by GavickPro, this theme offers a bold countdown timer that lets your visitors know when the big event is scheduled to happen. It features large call-to-actions for purchasing tickets as well as sliders that display who will be performing at the event. You can also display the sponsors in a stylish grid, set up a full schedule on its own dedicated page, and create pages for sponsors, speakers, musical acts, and more. 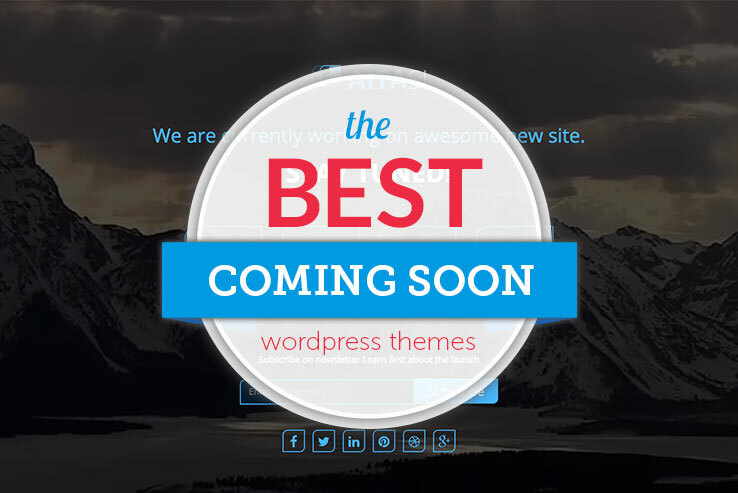 The theme comes packed with numerous widgets, page styles, and post formats to give you plenty of options when building a “Coming Soon” page or full-featured site. It even has a blog for posting the latest news about how your project is coming along. Juno, with awesome features including unlimited Color option. Thanks! Juno seems like a great option for a Coming Soon Page.